I have been using OneNote as my planner since October 2015. This has made me more organised and has made it easier for me to plan lessons. In this post, I will give some examples of my planning process through using OneNote and walk you through the steps to follow so that you can get started using OneNote for your planning too. First of all, you need to set up a OneNote Notebook. Log into Glow and go to OneDrive. Click “New” and select “OneNote Notebook”. Give it a sensible name such as “2018-19 Mr Allan Planner” or even just “2018-19 Mr Allan”. Eventually you will end up with several planner OneNotes over time. Once the Notebook is created you need to add some sections to the OneNote Notebook. Planner (obviously) – more on this section later. Starters – this section allows me to save my Powerpoints for starter questions for each class. CLPL + Stuff – this section contains my CPD record for the year, including links to blogs/articles/websites that I would like to get round to reading(!) and can also include reflections. I also save any resources or notes taken during CPD courses. This bank of information on my CPD for the year (and over years if I look back through my other planners) makes it very easy to complete my PRD and to complete my Learning Log. I also use this section to keep note of passwords (in a coded way, obviously) and usernames for all of the different online platforms that we need to use. Equity In Numeracy – This section is used for saving my resources and evidence of progress in relation to my role as Principal Teacher Equity in Numeracy. It’s really helpful keeping everything in one place. EMIF 2018 – This section contains all the resources for Enterprising Mathematics in Fife 2018. Reading Group – I run a Professional Reading and Reflection Group in my school. This section allows me to keep track of the different chapters that I think should be included in future weeks, reflections on the reading and notes about our discussion. I also keep a note of the names of staff who reply to my monthly email saying they want to attend. You might come up with other uses for OneNote – that’s what it’s all about. Now that you have the sections you think you will need (and you can always add more as the year goes on) you need to build up the planner pages. The squares next to the period numbers are tick boxes. Once I have planned that lesson I click on the box and that means I don’t need to worry about that lesson until I come to teach it. I have a different template for the other days of the week, and include the class names. I keep the heading as “Mon ” or “Tues ” etc. Then, once I have a whole week with the class names in the right places, I copy the template for the whole week (5 pages) and paste it below the templates. Then, I manually (it doesn’t take long!) type in the dates. So “Mon ” becomes “Mon 4th June” and so on. Spending a bit of time repeating these steps until the whole year has been built up doesn’t take too long. So far, I have not found a way to make this automatically happen. If anybody can, please share. Note that it is important to put the class names in first, before copying the pages (as this saves you having to type the class names in every day). Having the whole year in the planner section at the beginning of the year means that if somebody suggests a meeting at the end of the day on the 29th of January, I can quickly check my planner and add it to the page. I guess I should be using the Outlook calendar better – something I will address in the future. The Lesson Planned column is used for a quick description of the lesson. I have seen myself just type a few words (e.g. “Area of Triangle”) but have also used this cell to include examples of questions I want to ask, screenshots of resources I might use, web links to resources online, ideas for starter questions, reminders to follow up with pupils about behaviour or homework and so on. I also use this column to remind myself of the things I need to do during my non-contact periods, such as keeping myself organised for meetings or reminding myself that I really should make a start to my reports. Using OneNote on a PC, if I open the Powerpoint from OneNote and make some changes to the file, then click save, it automatically saves the new version to the OneNote. This means I can plan at home and switch on my PC at work and my lesson is waiting there for me. This works for any type of file – if you have it saved to OneNote and open it then edit it then click on save it will update automatically. And it will be available on all of your devices. Really clever. (Note that this automatic saving feature doesn’t work in OneNote on a Mac. My way around this is to have a folder on my Desktop called “Move to OneNote” where I save the Powerpoint from OneNote, edit it, save it back to the Desktop then copy it back to OneNote. I really should use my Microsoft Surface more! If you go to bit.ly/MathsOneNoteTeachers you will find, among other things, a template for a week that can easily be edited. Happy to try to answer questions, or to support people getting started using OneNote. Feel free to get in touch, or to share how you are using OneNote to help you keep yourself organised. Get in touch on Twitter or in the comments. This entry was posted in Professional and tagged Curriculum, Glow, Learning and teaching, Mastery, mathematics, Microsoft, onenote, secondary, Uncategorized on 3 December, 2018 by mrallanmaths. Clear and consistent routines are a significant part of the whole story when it comes to classroom management and behaviour management. Obviously positive relationships and correct support structures are also important, but this post is about routines. Pupils in my S1-3 classes have lessons that start as follows. Our lessons are all 50 minutes long. Before they arrive (or just as they are arriving): I put their Numeracy Ninja books and yellow starter question jotters on their desks. They sit in rows of 5, so often this just involves placing two bundles at the end of each row. This takes me around 1 minute. Below I have taken the time to place them on the correct desks. I do this if I don’t have a class the period before. First 2 minutes: Pupils arriving and getting “organised”. This is very specific. You are not organised until you have a pen/pencil and your maths jotter out of your bag and on your desk. You also need your outside jacket/jumper/hoodie off and your tie on. If you don’t have a jotter you need to ask for a piece of paper and if you don’t have something to write with you need to borrow a pencil straight away. I record a list of names of pupils on an A3 whiteboard on my desk just to remind me to get the pencil back. Sometimes this all takes longer than 2 minutes and sometimes less time depending on how far pupils have to travel. If you come in and waste time, and I catch you doing so, you are given a warning. Next 5 minutes: Pupils are working on Numeracy Ninjas (see: https://www.numeracyninjas.org) in silence. The teachers in our department believe that this daily practice of basic numeracy skills is raising the standards of numeracy skills across all classes, so this is the second year we have run it with all BGE classes with the exception of the top sets in S3. I use the time they are completing these questions to go round and double check that everyone has their red maths jotter out, is in correct uniform and is coping with the questions, offering quick help if needed and focussing attention if pupils’ eyes wander and they begin to think about striking up a conversation. If you are stuck, move on to another question. Exactly when there are two minutes remaining on the PowerPoint timer I freeze the screen and start a 2 minute countdown on my Ikea kitchen timer. This allows me to quickly complete the electronic register and check if any urgent emails have been sent (this is probably not necessary, but only costs me seconds). I then spend the remaining time circulating the class. I now have the choice of surreptitiously switching off my Ikea timer (which I carry with me) if I need to extend the time because I might be talking with a pupil about a question or having a quiet word about their negative behaviour at the very beginning of the lesson. This works really well. Next 2-3 minutes: I read out the answers to the Numeracy Ninjas questions. This used to take much longer, but we are beginning to get faster. The third set of 10 questions (Key Skills) usually take the longest, because I discuss the answers/solutions to most of the questions quickly. Any more involved questions might be gone over in full at the board if I have noticed that several pupils are stuck. If one of the Key Skills is relevant for today’s lesson, I will definitely go over it quickly. I don’t allow this to take very long at all and, like I say, this has taken time to get fast. Not all of the pupils will have attempted the Key Skills questions, so they used to think this meant it was okay for them to close their Numeracy Ninjas booklets and doodle on the cover while they wait. This has taken weeks to get right, but now, because I insist on it, all pupils wait and listen to the explanation/questioning of how these questions are answered and are expected to copy the methods for questions we discuss that they struggled with so that they can attempt the same question type when it next appears (probably next day). Once we have finished going through the answers: Pupils record their score and belt colour then turn their booklet over and fill in the table that tracks their progress over the term. The Numeracy Ninja booklets are then passed to the end of the row for me to collect and we are then onto our yellow starter question jotters. I already have the starter questions (usually 3 or 4 short questions) prepared on the smart board on a separate PowerPoint, ready to go. These consist of questions that will serve two purposes: revise previously taught topics and prepare pupils for our upcoming lesson. For example, yesterday my S3 class (Third/Fourth Level) had to write out the first 8 multiples of 125. In the lesson, we were learning how to change a decimal number to a fraction. Changing 0.625 to a fraction was a doddle because they already had the multiples of 125 to hand, allowing them to focus on the new learning rather than on “what does 625 divide by that 1000 also divides by?”. Next 5 minutes: Starter Questions. Pupils answer the starter questions quietly. 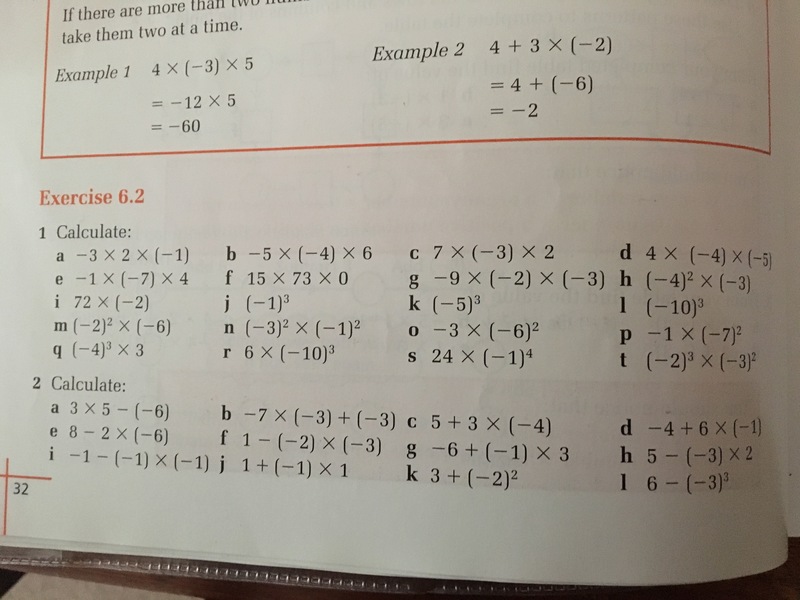 The advantage to having starter question jotters is that the starters all stay together in one place so that if yesterday’s question 1 was “Change 0.34 to a fraction” and today’s is “Change 0.52 to a fraction” they should have written down how to do yesterday’s question when we went over it. This will help them today. I have only been using the yellow starter jotters since the start of this term, but am already finding pupils using them effectively in this way. While they are working on these questions I am circulating, looking at the work they are doing and checking for misconceptions to point out when we go over the questions. I’m learning who is stuck, how confident the class are as a whole and how much more input they need on the basics before we can start today’s lesson. While I am circulating I will also collect the Numeracy Ninja books. Why not get a pupil to collect them in? Well, I don’t want a pupil out of their seat and if they are collecting the books for me this means they won’t be answering the starter questions. They just don’t have time to collect the books, and I know I’m going to be circulating anyway. Some teachers will probably believe that it is the pupils’ job to distribute and collect resources. I disagree. Next 3 minutes: I quickly go over the starter questions. I don’t need to get pupils to share their answers because I have already circulated and know what they can and can’t do. I go over the questions and pupils mark their own, making sure to write down a full solution if they have not answered the question yet. Once we have finished going over these, the yellow jotters are passed to the end of the row and put in a neat pile for me to collect when I next walk past. All of this has taken 18-20 minutes out of our 50 minute lesson (on a good day). I then need to make a decision about how the rest of the lesson will pan out. I will begin the period with a plan such as “Today we are going to learn how to multiply fractions where one of the fractions is a mixed number”. Depending on how well they have coped with the starter question that asked them to change three and two fifths to a mixed number, I might get them to do a few more of these first. In a “normal” lesson, I will introduce the new learning by writing the title on the board. 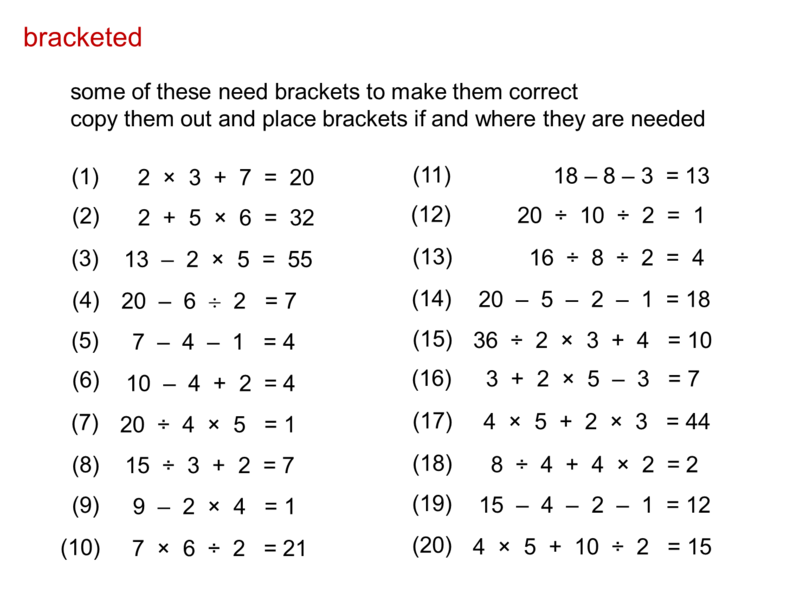 This is copied into their red maths jotter (these came out of their bags right at the beginning of the lesson). I’m a huge proponent of explicit instruction, so I will typically complete some example problems for pupils to think about (My Turn). I will question pupils on the bits they should already know about. They don’t copy these down because they are about to complete some quick problems in their jotter that are similar in format to my examples (Your Turn). While they are working on those (for usually around 3-4 minutes) I will circulate and keep pupils on task and also help those who are stuck. We go over these problems with much more questioning from me than in the starter questions. Pupils generally do fairly well because they have had help and because the questions are very similar to the examples. This success builds confidence and is usually followed by some independent work. When I know that some pupils need more challenging questions to complete, I will write some on the board. If other pupils are stuck I will bring those pupils together at the board and discuss a few more examples with them. This seems to be working very well. The main chunk of the lesson is usually different depending on the tasks I have set for the class. End of the lesson: I have the time of the bell down to the second so I know when we need to stop and when we need to pack up. We don’t start packing up until there are between 1 and 2 minutes left. That’s way plenty of time. Those who have borrowed pencils need to return them to me. Everyone packs their jotter away and stands at their desks. I might take a moment to speak with the pupils who seemed less confident to begin with and see how they felt about their work. As a class, we might use 1-5 (show 1-5 fingers) to share how confident we are feeling about our lesson. 1 means “I don’t have a clue what we just did” and 5 means “If Mr Allan was off tomorrow I could probably teach the class”. They are beginning to realise that this is valuable feedback for me that helps me to decide how we progress as a class. I have made it a safe place for pupils to say they are stuck or are not confident. I find that almost all of my pupils take this seriously, and don’t just blag their way to a 5. They also know that I already have a pretty good idea how they are getting on. I might also use this time to put the next class’ Numeracy Ninja booklets and yellow starter jotters out, ready to start the whole routine again. This entry was posted in Professional and tagged Curriculum, Glow, Learning and teaching, Mastery, mathematics, Microsoft, onenote, secondary, Uncategorized on 29 August, 2018 by mrallanmaths. BODMAS, BIDMAS, PEMDAS… It doesn’t matter what you call it. As long as they know what order we carry out calculations in. I decided to begin the topic by showing my S3 class how they could write any expression involving subtraction as a sum. So, for example, we changed everything in the form a – b to a + (-b). We discussed the fact that, because of the commutative law with addition and multiplication, it didn’t matter now which order we carried out the calculation in (since (-b)+a yields the same result). We then changed every quotient into a product. So c/d became c x 1/d. We spent a lot of time manipulating expressions this way. I took the opportunity to also introcuce the distributive law, so that I could properly explain what the point of brackets was. I didn’t mention BODMAS, nor did I teach them an equivalent acronym. Instead, I simply said that they should evaluate products before sums. Anything with powers is just a product, so clearly the powers have to be done first. In fact, they can be done at the same time as the products. It’s important to know the difference between 3a^2 and (3a)^2, and there’s a nice Standards Unit task for that. We spent some time working on these new skills. Mainly using multiple choice questions and “insert the brackets” questions (see Don Steward). In order to assess how well the class had grasped the order of operations work, I presented them with the Four 4s problem. If you’re unfamiliar with this problem, see this. Using an open question such as this allowed me to see how much they had learned. I also particularly liked this because they are not all correct. This meant that the rest of the class had to evaluate each expression and figure out how to change it so that it did evaluate to 17. Timing the Four 4s problem in the middle of this topic allowed them to really experiment with the capabilities of using fractions, negatives and powers, including roots. Also, they seem to have learned that multiplying by zero results in zero. 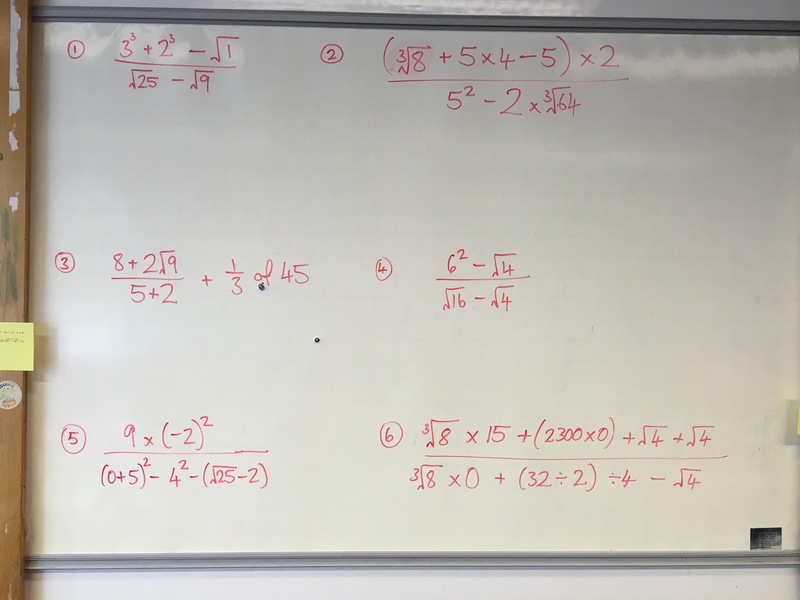 This entry was posted in Professional and tagged BODMAS, Curriculum, Glow, Learning and teaching, Mastery, mathematics, Microsoft, onenote, Order of Operations, Resources, secondary on 4 July, 2016 by mrallanmaths. Annually, teachers in my school are expected to be observed by a member of the school’s senior management team once. Just once. Departments also have their own internal observation policy, and this usually involves PTCs observing teaching staff in their department one time during every 12 months. Teachers decide on a focus and pick which class they are observed with. A form is filled in during the observation and time is built in afterwards for feedback. This is all good, because it gives teaching staff an opportunity to get some valuable feedback on their teaching. The problem is…it’s fake. It’s the same thing that happens with inspections. You get notice. And between getting notice and the time of the observation you stress and stress and stress. So you work jolly hard at making sure everything goes perfectly well in the lesson. Maybe you warn the pupils the day before to “behave” because Mrs So-And-So is coming to see them learn. The observation comes round and you show off the fact that you can write Learning Intentions and Success Criteria and differentiate the material so that the fast finishers are kept busy and the less motivated learners are supported. You even squeeze in a plenary full of AifL. Is that learning and teaching in action? Ticking boxes in an observation? I want an observation policy that means the senior leaders and my PTC know that I strive to make sure that every lesson ticks all the boxes. I want them to know that sometimes it goes wrong. Sometimes the learners misbehave and sometimes I don’t use clear Success Criteria. Occasionally I forget to make my instructions clear enough. Sometimes I miss out having a tough problem for the high fliers to sink their teeth into when the intended learning has been achieved. Sometimes the bell rings before I expect it to. What surprised and disappointed me most recently was something that I heard at a union meeting while discussing the Working Time Agreement: “You will be observed once by the senior leadership team. You will agree on a date, time and class and the observation will go into the diary. If, for any reason, the observation is missed (e.g. the senior leader is out of school or has to attend a meeting) you are not required to reschedule your observation. They get one shot.” Who is this for? Is it to comfort teachers that don’t want to be observed? I piped up “But you’d miss out on valuable feedback!?”. The reply was “well if you want to reschedule the observation, you can, but you don’t have to – they can’t make you”. They let teaching staff gain valuable feedback on their teaching – this is the most important purpose. They allow subject PTCs to gather evidence of how the department is performing – this helps with the writing of department scoping papers and so on. The allow school leaders to monitor the standards of learning and teaching across the whole school, highlighting areas of strength and areas of weakness so that interventions can be put in place when needed. Basically, we need to calm down about observations. The stakes are too high and they really don’t need to be. If the school is supportive and the staff are supportive and everyone is reflective then observations should be the norm. They should be able to happen whenever the observer likes. You shouldn’t be putting on a show for an observer then settling for “fine” lessons the rest of the time. Treat every lesson as if it’s an observation. You’ll quickly see that that would be unsustainable. So instead treat every lesson like you want the best possible learning and teaching to happen for the learners in your class. At the end of the day, that’s what really matters. This entry was posted in Professional and tagged Curriculum, Glow, Learning and teaching, Mastery, mathematics, Microsoft, Observations, onenote, Professional Development, secondary, Uncategorized on 4 July, 2016 by mrallanmaths. Back in 2016 I was introduced to OneNote. I have since used it to transform the way I work. I may blog about other uses for OneNote in a separate blog post but this one is all about how I have used OneNote to create a digital notebook for Higher Maths. BONUS: This OneNote also includes information about my Cognitive Load Theory Presentation, that has most recently been presented to Scottish Borders Maths Teachers during their in service in November 2018. OneNote is accessed through Glow as part of Office 365, though the software can also be downloaded for free from https://www.onenote.com. Glow users in all Local Authorities in Scotland can download the full version of Microsoft Office on up to 5 personal devices for free – speak to your school’s Glow person for more information. This link will take you to the OneNote where you can view the full thing: Higher OneNote (Glow sign in NOT required). If you would like to be added to the list of users who have permission to edit and add resources please get in touch. Send me a tweet at @mrallanmaths or email me: mrallanmaths at gmail dot com. What I have done when creating the OneNote is I have made extensive use of the HSN materials (available at http://www.hsn.uk.net/higher-maths/notes/). I have also uploaded some resources from my department’s course folder, though these are quite outdated. My aim in sharing this has been to encourage teachers across Scotland to pull together and create a digital bank of resources for Higher Maths all in one place. The OneNote includes instructions to guide teachers through creating a separate OneNote Notebook for their class, which they can share with their pupils in order to allow them to access the content at home or in class. OneNote can be used as a digital planner. There is an example of this in the shared OneNote. This entry was posted in Professional and tagged Curriculum, flipped learning, Glow, Higher Maths, Learning and teaching, Mastery, mathematics, Microsoft, onenote, Resources, secondary on 4 July, 2016 by mrallanmaths. Quickly thrown together on my board, by hand, 20 minutes before the class started. 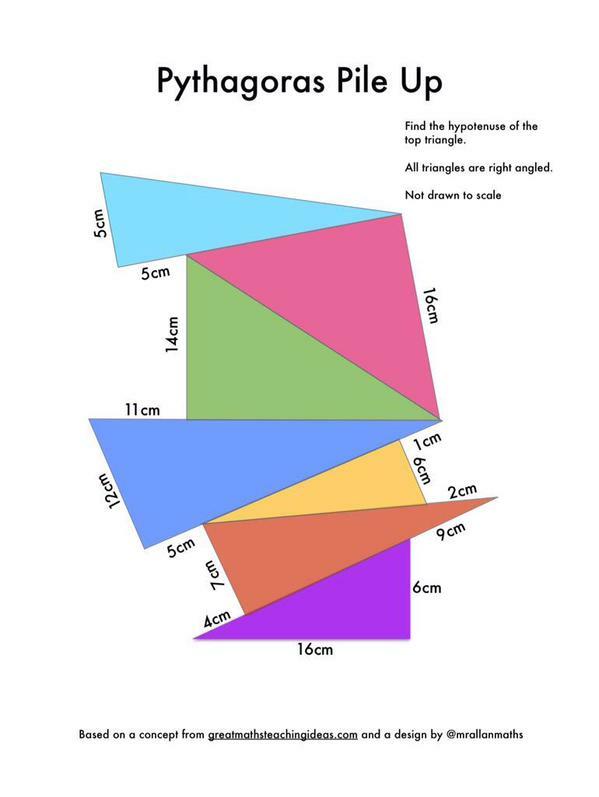 This question was inspired, of course, by the “Trigonometry Pile Up!” by Great Maths Teaching Ideas. Once I had finished drawing the question, I realised that it would take longer than a normal starter question but I still went with it, but instead called it a “Challenge Question”. What I like about this question is that the pupils can see what they have to do straight away. There are no surprises. I genuinely just wanted them to get some further practice applying Pythagoras’ Theorem, while also stretching their resilience. When this was then shared on Twitter it quickly became my most favourited and most retweeted tweet of all time. It still gets retweets to this day. To download the file, click this link. 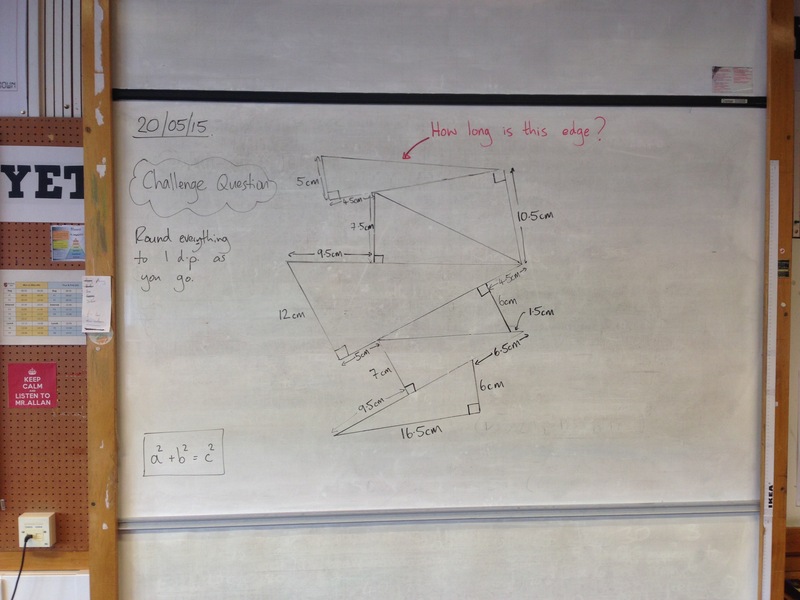 This entry was posted in Professional and tagged Curriculum, Glow, Learning and teaching, Mastery, mathematics, Microsoft, onenote, Pythagoras, Resources, secondary, Twitter on 7 August, 2015 by mrallanmaths.